This week has been a strange mixture of unrelated tidbits from everyday life. I've gotten many things done but haven't managed to get anything photographed. Thus, there's no pictures at this time. I received my "goodies" from The Thread Studio. It is always such a delight to tear open the bag, but it was especially nice this time. Inside was a signed copy of Dale Rollerson's Surface Tension. Here's a slightly embarrassing admission. I've been reading about "the embellisher" for quite some time without really knowing to what it referred. Eventually, I figured out that this mysterious piece of equipment was likely a needle punch attachment for a sewing machine. This was confirmed on the very first page of Dale's book. I bought the new machine about two months ago. I haven't taken the first stitch on it. I hoped to use it solely for this "mysterious" embellisher. I bought it when I took my 1630 in for repairs, to correct the needle that was hitting the bobbin plate. Mr. Leichtner never called to say that the machine was fixed. I finally just "showed up" last week with the 1008. The tension wasn't working properly in this machine. It was time for servicing....and finding out if the 1630 was working...and finding out more about this needle punch attachment. All these minor problems and Dale's book, however, prompted me to call the Bernina dealership in Sumter. I now have "the embellisher", a video, the needle plate, and a 18" x 24" plexi-glass table attachment on order. Hopefully, one of the two other machines will be working by Tuesday. My plan is this: Continue doing all the work before stitching on several pieces from my In Box series (that's about 75% done!) Figure out how to wind bobbins, thread, and operate the 220. By the Fourth of July, start sewing. In the meantime, Alex got his first paycheck from Subway. Mathias has been given several opportunities to prove himself at Birmingham Royal Ballet. The company is in the midst of a "split tour"...half perform at three different locations in the south of the country while the other half perform go north. Mathias is part of the northern tour. With the company divided, there are opportunities for members in the second cast to perform...to prove themselves. Mathias is very upbeat about his chances. He feels very good about the way things are going. 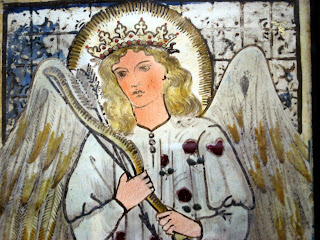 Today, he appears in all three pieces being shown in York....where he loved the cathedral, especially the crypt church. I follow several wonderful writers that are members of "Friends of BRB". My favorite fan is easily Janet McNulty. She has written about so many performances and made me feel as if I'm there in the audience, watching Mathias and his new friends, applauding. Below is the Internet listing from last week's performances in Durham...where Mathias also visited the cathedral...he's taking advantage of a little sight-seeing too! It's been a long day. Monday is generally a long day. This is the time I face the items brought to Mouse House that require framing. Let me explain something....I really don't "custom frame" anymore. I'm more than a little arrogant...which embarrasses me a bit...I only frame for people who trust my style, taste, and selections totally. Mouse House (me) requires that each client simply leave their artwork with my husband Steve. Their input is simple...we need the telephone number to which we will dial upon the completion of the order. Customers don't get to know what I will do, when I will finish, or how much it will cost. No client gets any input about moulding, mats, size, price, or when the order is done....quite arrogant. Thankfully, we don't advertise this...or I'd really be "swimming in work". Strange...I always framed things "appropriately" with "reasonable" prices. Now, six years after down-sizing a business with fourteen on payroll to just Steve and I, I am still too busy. Too many people trust me. I am far too trust-worthy. I am prompt. Nothing takes more than ten to twelve days to frame. I'm still less expensive than anyone else in town. Thus, I'm busy. Today I faced over 43 pieces of children's artwork for the local school district's permanent collection. I also had at least 20 other pieces from several clients and 37 botanicals that we decided to do for "stock" at Mouse House. So...it's been a long day. I've been cutting mats and designing things since 8:30 AM. I've also been checking my blog. The only thing making all the work tolerable is the fact that I've just posted my video of Nails in a Coffin, 1861 - 1864. I'm anxiously awaiting feedback. I'm wondering how all the people out in "cyberland" feel about this new work. Sometimes, offering one's work to the world is like walking naked down Main Street. There's a "Lady Godiva" sort of intensity. Secretly, I ask myself, "Do they like it? Do they approve? Am I good enough? Did it make sense?" Somehow, the anticipation of acceptance (or rejection) got me through the busy day of framing. Between cutting mats and designing pictures, I also received a message that "I've been tagged". 1) Both my boys were born on their due dates. 2) I put my husband through graduate school by delivering singing and dancing telegrams in Columbus, Ohio. 5) I take advise from my nineteen year old elder son because he's smarter than me, world famous, and closer to "perfect" than anyone I've ever known. 6) I know that God has a sense of humor because he blessed me with my younger son who is quite like me and very, very difficult...totally unique. 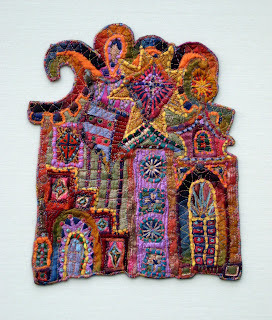 7) I am extraordinarily apprehensive and nervous about my fiber work because I lack an academic background, don't know the name of many stitches, can't make anything "useful" with any of my sewing machines, and haven't read many books (including the ones I own). Okay, so there it is. Confessions. Seven things about me...tagged. I will be thinking of seven others on which to inflict this "spotlight"...but I will likely just "skip" that portion of the requirement....sue me! ALEX and his wonderful, one-man production company (Ninja Space Monkey), finished this video of my artist book. The book is the result of an experiment using rusty nails and silk. 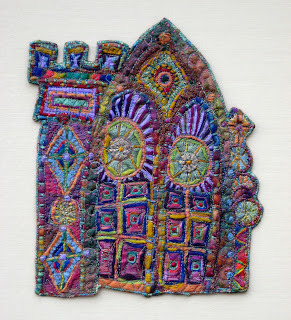 I am totally indebted to the group of talented fiber artists on the Fiber Art Friends blog ring for introducing me to this idea and sharing their results as well as excellent instructions for the process. In a sense, the weekend started on Thursday at 4 PM. Lady Street, right outside Vista Studios' doors, was blocked off and patrolled by the Columbia police department. It was "open skateboarding" time down three sloping blocks of pavement in temperatures that were in the low 90s. The skaters didn't seem to mind. They did tricks and sweat bullets. I bought four cases of bottled water and dispersed them to everyone. There were skaters as young as six, and the older teenagers were all very supportive of these beginners. There were only a few girls. It was amazing to see. The art reception started at 7:00 PM. There was no alcohol. Everyone used the trash cans...quite unlike the typical art opening...quite unlike the stereotype of "property destructive skaters". Several skateboards sold. T-shirts were $15 toward the non-profit Pour It Now that hopes to get a proper skate part built here in town. It was a nice evening. Alex and I are planning to create a video of the show. No images, however, can relate some of the wonderful things that happened. A man and his young son drove up from Orangeburg. I watched the locals melt down feelings of apprehension within seconds. They all skated together. A lady brought in dozens of brand new CDs that had recently been released by her husband. They were for the skaters because one of the songs had been inspired from her husband's teenage years as a skater. The State Newspaper ran an article on the show in the "weekend section" that included two of my photos...in color! It is below (without the photos). Can’t afford one of those BMWs that has been painted by Andy Warhol, Jenny Holzer or David Hockney? How about another four-wheeler — a skateboard painted by David Yaghjian, Susan Lenz or Lauren Gregory? Because skateboarders are generally creative types — in techniques, haircuts and how they decorate boards — it seemed like a good idea to get artists involved, Toole said. He had lined up skaters/artists to do the show when Susan Lenz, who has a studio at 808, offered to help. So did artist David Yaghjian. Yaghjian’s daughter and Lenz’ son are friends with Dreher High School junior Dorian Warneck, whose movie “Welcome to your DOOM” will be shown at 4 p.m. Saturday. Money raised from the sale of the boards will go toward helping build a new Columbia skate park, Toole said. Both Lenz and Toole see the collaboration rolling both ways. “I wanted to incorporate different people, not just skate boarders,” Toole said. “It brings a different group of people into our space as well,” Lenz added. WHERE: Gallery 80808/Vista Studios, 808 Lady St.
Two skateboarding videos debuted over the weekend. The following images are of the seventy-five or so people gathered to see Dorian Warneck's film at 4 PM on Saturday...right outside my studio door. It was a very, very professionally created and edited film. I was more than a little impressed. Even though all this was going on, I was still able to get lots of work done. 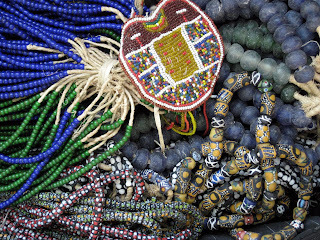 I managed to put together over forty pieces for hand beading...my African images on individual pages of a book called Black God. The title appears at the top of each page. I had already transferred all the pictures. I just put each page with two pieces of handmade or decorative paper in order to create an interesting background. This meant, however, digging out all my papers from under the worktable. It was a mess...a total disaster all over the studio. Jeff Donovan had given me a wire rack recently. I used foam board to create sturdy shelves and finally organized the papers. The studio looks much more tidy. Later, I put together Strata VIII. Hopefully, I'll have photos soon. I've served on a committee at Saluda Shoals Park (www.icrc.net/saludashoals). My friend Dolly Patton is the executive director of the non-profit foundation associated with the park. I've also roped her and her 10-year old daughter Sims into decorating a skateboard for the charity event, Skate and Create. Yesterday, there was another meeting at the Park. Dolly is spearheading an art day for this coming October. I went to the meeting and submitted my proposal to do a burnt felt leaf installation that will include demonstrating that day. I hope I get selected; I'm pretty excited about making all those leaves. I've always wanted to make more than the 100 or so that I've got. Yesterday, Steve discovered that his bicycle, a tool set, and the weed-eater were stolen out of the garage. He seldom forgets to lock it, but he did. I guess this is one of the disadvantages to living downtown. Alex is still working at Subway. He's never gotten out of bed as easily in the morning. He's still working on his skateboard but it is coming along. It is due this afternoon! 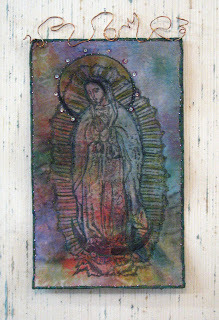 Shown here is my "Skate Saint" Xerox transfer onto heat transfer painted polyester (front) with the stitched outline over a background that includes painted WonderUnder, metallic foiling, snippets of threads, and a sheer chiffon scarf overlay (back). I'm donating it to the Skate and Create fund raiser which starts tomorrow. Strata VII is completed, mounted, photographed, and ready to go into its frame! That's five "Strata" and two "In Boxes" for the solo exhibition at Francis Marion University. I'm halfway there! I left a few areas as "holes". 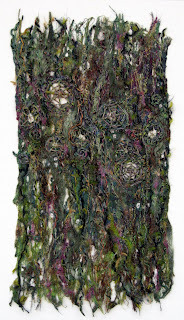 Into these voids I hand stitched spider webs and also added big, bulky French knots for additional texture. I'm quite pleased with this one. Today, I also took my book, Nails in a Coffin, 1861-1865, out from under the weights. I'm always nervous about this part of book construction...worried that I've missing some detail or that I didn't align all the stack of signatures up correctly on the end papers. Fortunately, nothing went wrong. I photographed all the pages today and will hopefully soon have a video to share. It's been a wonderful, productive weekend...hours upon hours...uninterrupted work time in my studio...no music, no telephone, no conversation...just creative solitude...a slice of heaven. I had plenty to do. Most of my work had been anticipated before the weekend. 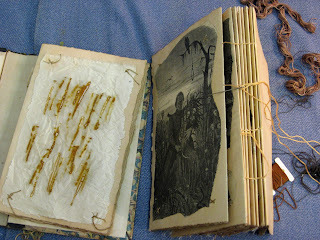 I knew I had to rust more fabric with nails in order to complete the artist book, Nails in a Coffin, 1861 to 1865. I needed five more pieces but I rusts dozens more. I rusted the five pieces of silk, several different pieces of silk, and quarters of old damask napkins. The three fabrics took the rust in utterly different ways. In any event, I was able to finish the pages for the book. The photos here show the signatures being stitched together. As I type, the entire thing is under weights. Tomorrow I'll see how the completed volume looks. Alex will hopefully make a mini-video of the result within the week. If so, I'll post it here. Later I'll have images of Strata VII. I finished it over the weekend. I also had to create an artistic skate board for the charity event that opens this Thursday. I'm the sponsor, afterall! I decided to create Skate Saint, based on the Virgin of Guadeloupe...with an altered crescent moon skate board. I took an image from the Internet, desaturated it, and altered it further with PhotoShop. I traced the reverse onto the skate board and painted bold areas of color. 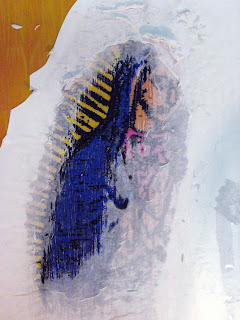 Then I did a photo-copy transfer onto the painted areas. One of these images shows how I scrubbed off the photo-copy paper to reveal the transfer. Later, I embellished the figure with sequins, beads, paint, jewelry, and plastic heart-shaped buttons. It's done. Thank goodness. 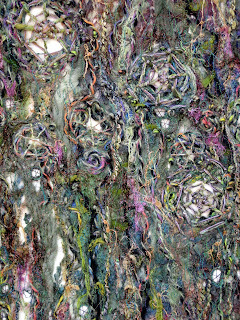 Yet, I also had to do something "fiberish" with this image. I took one of the photocopies and transferred it to a piece of polyester using Xylene. First, I colored the material with heat-transfer paints. Before I knew it, I actually made a miniature quilt. It still needs a few beads...mostly because I can't resist. I'll put up a photo soon. 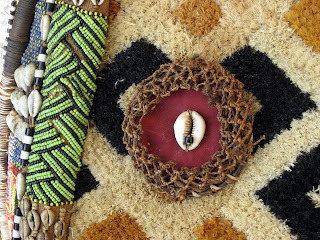 Speaking of the "irresistible", I also prepared a number of African artifact transfers on book pages...I prepared them for hand stitching...even though I need to do this like I need another hole in my head! Alex got a job at Subway. His first day was Friday, 9 AM until 3 PM. Steve and I held our breathe all day, suspecting a telephone call to say that he quit or was fired or hated it or something "bad". Afterall, Steve and I haven't been able to make him work more than three hours at a time. We pay better than Subway. No call. No problem. He walked to CMFA and prepared for the end-of-program performance in which he would be partnering one of the older ballet dancers. Steve and I went to watch at 5 PM. It was a hoot! I took some photos but most of them were terrible...too blurry, poor lighting...I was far away too. 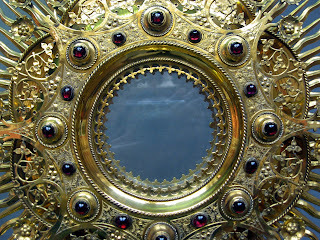 I'll post two others on my other blog...http://susanlenzfamily.blogspot.com. After the performance Alex told us that his next day of work started in the morning at 8 AM. It would last until 8 PM. Steve and I roared with laughter...but Alex made it through the long day. Today, Sunday, he worked from 10 AM until 6 PM! I still can't believe it! 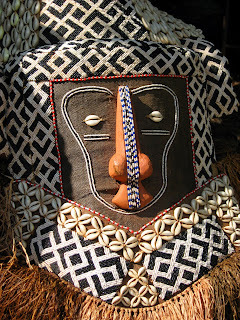 I love African artifacts! I look forward to Demba's visits to Columbia, when he pulls his large utility van loaded with West African artifacts into town. This time he set up "shop" on Doni Jordan's driveway. Stephen Chesley and I went together. 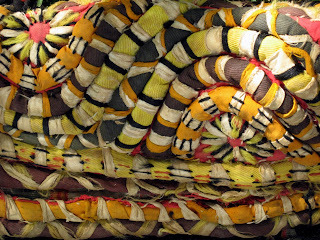 I bought five textiles to frame...for the business, of course...but I don't really care if they sell or not! 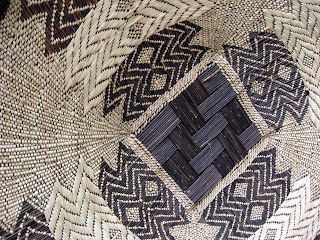 The five are all made of raffia, woven and cut pile. Tremendous buys and gorgeous work. Of course, one of the main reasons I get excited about Demba's visits is the opportunity to photograph his wares. Each time he's come, I've shot over 200 images...generally within a half hour to forty-five minutes. 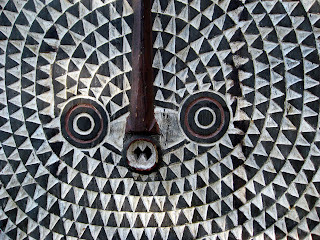 I've created my entire "African Series" using these photos...which got me my solo show last November at the University of South Carolina-Aiken. Now, the remaining pieces are on display at Bohemian Home, a local, independently owned furniture store on a fashionable shopping street here in Columbia. 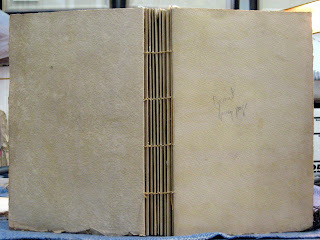 I've also been working...on and off...on two altered books and dozens of single pages using my African pictures. Now, I've got more! Demba always a vast assortment of artifacts. Rarely are there many of the same pieces, but I was happy to see a few of my "friends" from the last visit. 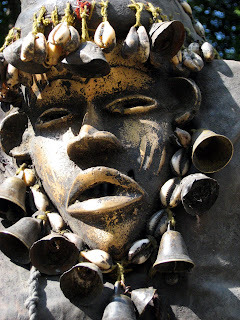 This time Demba brought more masks, more textiles, fewer pieces of ceramics and baskets, less furniture but spears, dolls, beads, and hats made of feathers. Most of these pictures don't need an explanation...and if they do, I'm hardly the person to ask! The dolls, however, were special. 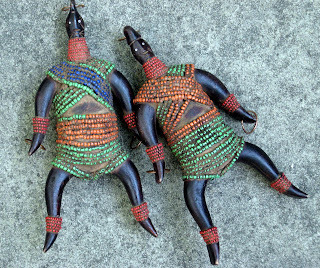 They were twins, meant to be given to twins upon birth to ward off evil spirits. Perhaps, Demba brought them because he knew that Doni is a twin. 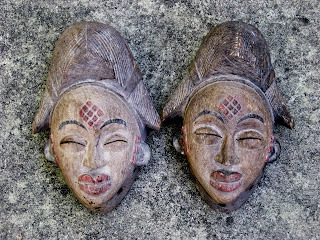 The two female masks I recognized as being from the Puna tribe. 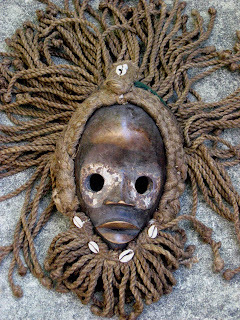 One of my favorite photos and resulting work was of a Puna mask quite similar to these...but with a slightly different hairdo! 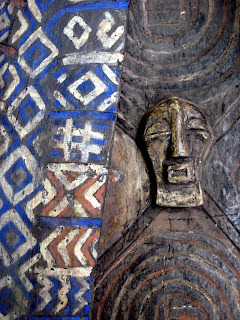 Even I am beginning to see the personalities of these masks and figures. One piece was for the same ritual as another I had photographed on one of Demba's earlier trips...from the time before my computer crashed and I lost all the photos! The piece I made using that photo won an award at the Mojo Arts Festival...$500. So, seeing this figure again really brought a smile to my face. Seeing all these pieces inspired me to continue on my African altered books, but I have so many other things to do...deadlines. I've also been working on several other projects already...ones that have nothing to do with my deadlines! So, working on the African pieces shouldn't be what I'm doing! I can't help myself, though. 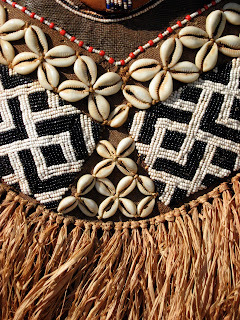 I will likely set up some hand beading on the single African pages...for evening stitching. 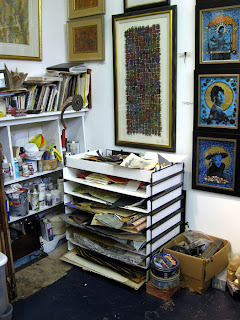 After the trip to see Demba and his objects, I spent time in my studio...doing what I am suppose to be doing. I started Strata VII. I used some of the fabulous threads I bought at the Oliver Twist booth at the Birmingham Stitching and Knitting show last September. I am playing with the idea of "holes" and circles on this one. Yesterday, before going to Demba's I spent most of the day working with my rusted fabric in between helping clients and cutting mats for the frame shop. I discovered that the book I am making is going to need five more pieces of the rusted nails on silk. How I miscounted, I'll never know. So, I set about getting that project ready to do over the weekend. How I wanted to finish it...but, it will wait. 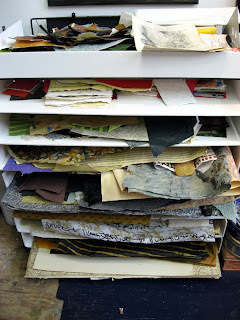 In fact, I think I'm going to do two more books like it...so, I'll be needing lots of rusted nails on fabric! Today, in between cutting mats and answering the ever ringing telephone, I color and contrast corrected my African artifact photos. I've been a bit nervous. Today was Alex's first day on the job...well, first job outside of our business. He's being trained at Subway. I hope this works. Alex has also been helping at CMFA for the past two weeks with the Carolina Ballet summer program. I can't believe he keeps this up. He's actually taken "men's class" this time. Frankly, I think he just enjoys flirting with the girls and hanging out with the male dancers. Maybe it reminds him of his brother? Keith Mearns and his girlfriend Abigail Mentzer are in town visiting Keith's mom and teaching for the CMFA program. Abigail is featured in this month's Dance Magazine. Hopefully, they will be dancing in the "little" program this evening. Alex will be doing partnering. Maybe Sarah Mearns is also in town and will be performing. She is a soloist at New York City Ballet. I have another "problem" hanging over my head. 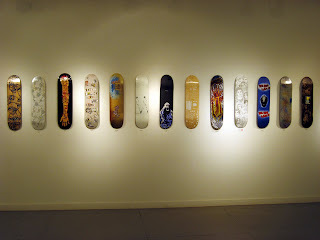 I sponsored an exhibit for the gallery at Vista Studios called "Skate and Create". The owner of the local skateboard shop, Dave, wanted to have a charity art event on national "Skate Board Day", June 21. Of course, without an artistic resume, professional quality photos of work to be exhibited, etc., there was little chance that he'd get approval to use the space. Since I rent a studio, however, I get two free weeks use of the gallery per year. I've never taken advantage of this. It feels too much like throwing your own birthday party and expecting all your friends to buy presents. Anyway, I donated my week to Dave. Dave has filed all the papers for non-profit status...to raise awareness of the need for a proper skating facility in town. (Columbia use to have a skate park but the city tore it down to make a high school football stadium.) The only stipulation for me to donate a week of free gallery use is that I must be a participant in the exhibit. My painted skateboard isn't done yet. It is due on Wednesday. I've helped, however, with much of the publicity. The event is going to be a great success...two films will debut and the city is closing our part of Lady Street during the reception as a "open skate" demonstration area. This is likely the longest post I've ever written. It has taken me all day...in between more mat cutting and more clients. It is Friday...always a busy day in a frame shop with people picking up their work before hosting a party over the weekend. I should preface that last comment. Mouse House is really no longer a frame shop! It used to be. Steve and I used to have fourteen people on payroll. The first clocked in at 6 AM. The last left at 6 PM...six days a week. I always got my "serious" work done between 9 PM and 1 AM. (The business is the first floor of our large, historic, downtown home.) Almost six years ago, I finally couldn't stand it. I forcibly down-sized this still growing business by firing my mat cutter and helping the others find new jobs. The down-sizing took two years. That's when I decided, without any real background or training, that it was time for me to be an artist. So far, so good! I still celebrate Bastille Day with the French...it is my day of independence too...I fired the mat cutter and made this life-altering decision that day. This is year six. Thankfully, I am married to a supportive man...although he has a PhD in civil engineering, he has worked for me since 1990. We figured out a way to live more creatively...and more happily. Good! I made it...a comment between each of these images! Well, by the time I got to creating Strata V (Winter), I was feeling really comfortable about this new soluble material. I decide to approach this piece as if it were a reverse glass painting. The things closest to the adhesive would be my front...I would stitch looking at the back through the clear soluble. By that I mean, put all the smallest, delicate snippets...the details...on the adhesive first. Then start adding heavier and larger things...covering the small ones up. Then stitch. It is a little backward, but I just can't figure out how to get all the little things to be held down after I've covered up all the adhesive with the bigger things. Anyway, it worked. If anything, I used machine thread that was almost too subtle in coloring. I really like this piece, which is saying something...I don't generally gravitate to these colors. I'm quite excited to get back into the studio this coming weekend and make some more. I've got several new ideas rattling around in my head. 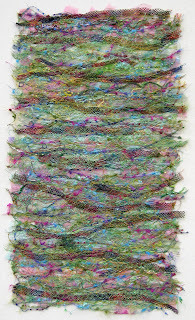 I will, of course, be in my studio each evening this week; but there's nothing quite like spending all day with your fibers...two days in a row. I'm feeling much, much better about the solo exhibit now. Below is the statement I wrote for the show. Although I type nearly as quickly as I speak and I adore writing, it must have taken two hours to come up with this statement! Every time I'm suppose to write something "official", especially for an academic setting, I really struggle. 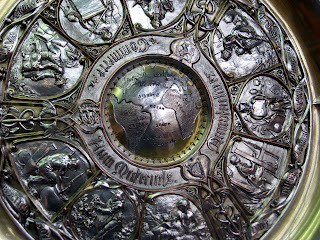 Next Monday, I have to send a CD with selected images to the university. I'm almost ready. Now, about ten more pieces to make before August 4. 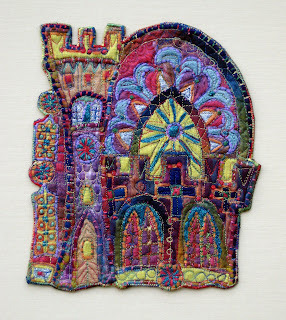 “Stitched!” will be an exhibition of contemporary free motion embroidery techniques by Columbia artist Susan Lenz featuring two ongoing but related bodies of work. 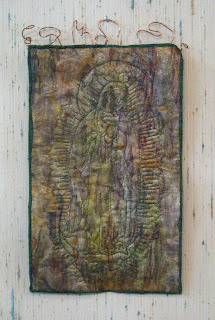 One is created on water-soluble fabric. The other uses a burning tool. 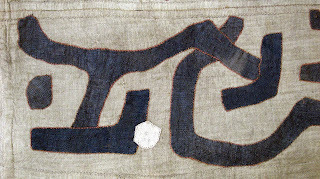 Both approaches seek to dissolve the very ground on which the embroidery is made. Design inspirations include aerial views of urban architecture and cross-sectional profiles of the earth’s strata. Above is Strata V (Summer) and below is the detail shot. This is my least favorite of the four pieces. Yet, I was learning quite a lot. I've used water soluble fabric before but not extensively. This new product is quite interesting. It has an adhesive on the heavier, opaque side (which looks like interfacing or Solusheet/Vilene 541...which I already use). This new product might even be called "Aquabond" at www.thethreadstudio, except I also got a clear soluble to go over the top of all my threads and snippets. I bought the first piece while in California. I used it to make Strata II and tried to call the shop for more but wasn't successful. I did an Internet search. I was able to buy entire rolls...WHOLESALE from the NYC supplier. So, I'm now able to really experiment. 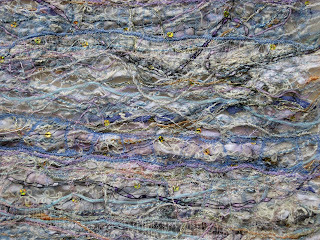 With the "spring" piece, I was attempting to be as "light" as possible with the placement of all the threads. I put in strips of very sheer chiffon (not the scarves...the fabric sold by the yard in shops). I was amazed by my results...I liked the back better than the front...so, that's the way it appears. With the "summer" piece, I was attempting to "sandwich" sequins and threads under a gold striped chiffon scarf. I put a piece of gold colored chiffon (by the yard stuff) behind the opaque, soluble fabric just before the free motion embroidery was done. I did very little machine stitching since I actually had two sheer layers of material. This piece, as a result, went very quickly...but I'm not wild about it. 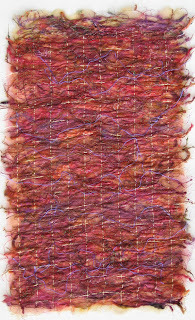 Since Strata III looked so much like autumn colors, I started thinking of it as such. The series was initially inspired by the strata of the earth, the multi-layered tiers of geology and all those cross sections of the globe in school books. There's a great sense of time being related in those courses...eons and eons, lots of passing seasons. Of course, I had just made an altered book called Earth Moods, so I had all these things on my mind. So, I figured that the earth might be deeply affected by the changes of seasons. I knew the next three in the series would reflect spring, summer, and winter. I have no idea why I made them in this order...it's alphabetical, but I didn't realize that until after I was done! 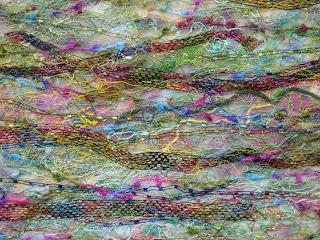 Above is Strata IV (Spring) and below is a detail shot. I'm nearly caught up! This is especially a good thing because the weekend will be another chance to work in solid, significant blocks of time. 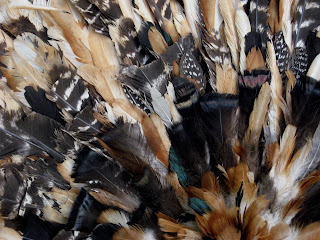 I'm on a big deadline to produce enough for the solo exhibition at Francis Marion University. The show is to have two bodies of work: my "In Box" series and my "Strata" series. Since I've sold almost all the "In Box" pieces I've made this year, I've been quite nervous. 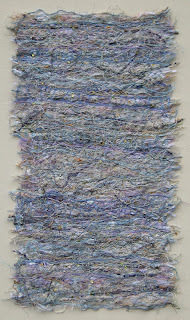 I hadn't really started the "Strata" series. 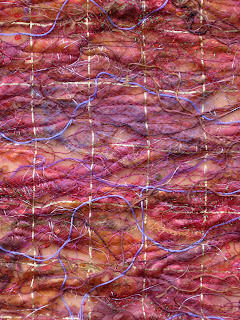 Strata I in currently on display in the 50th annual national juried show in Rocky Mount, North Carolina. 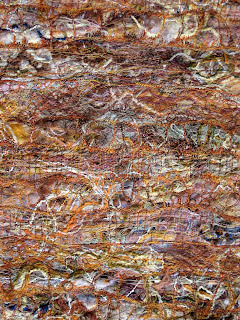 Strata II was a commission for DP Professionals. I really went out on a limb promising this body of work, but last weekend was quite productive. I managed to spend almost 20 hours in my studios and came up with Strata III (Autumn); Strata IV (Spring); Strata V (Summer), and Strata VI (Winter). 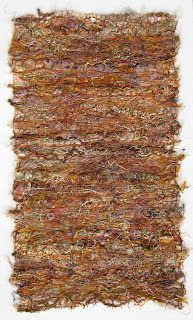 Above is Strata III (Autumn) which looks quite a bit like Strata I. The new pieces, however, are much bigger. All four made last weekend measure approximately 26" x 16" (which my mathematically inclined husband Steve figured out to be 41 x 66 cm). Below is a detail image. 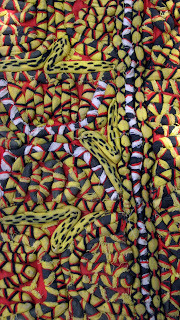 All four pieces are sewn onto linen mat board, have been photographed digitally and in slide format, and are waiting for Steve to build the liners and frames. 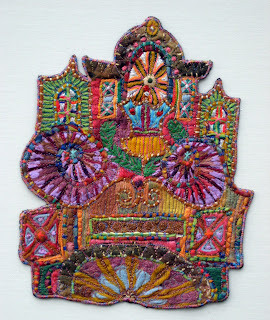 I stitched on the plane (using my dental floss cutter to snip threads). I stitched on the trains and in the evening while Mathias and Alex played soccer video games. I finished four and a half pieces during the trip and completed the last one just the other night. 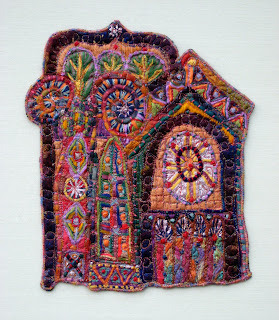 Once home, I covered each piece with a sheer chiffon scarf and free-motion embroidered into each one. The edges were free-motion zig-zagged. Each one is approximately 10" x 8". Above is Elements of Architecture XLII. Below is XLIII. Above is Elements of Architecture LXIV. Below is XL. 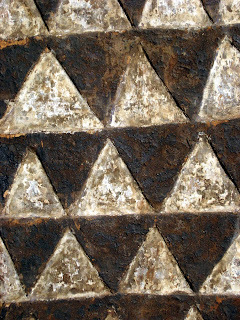 The last image is of Elements of Architecture XLI. Hopefully, soon, I will be taking pictures of the pieces I created over the weekend...my "Strata" series...pieces head to the solo exhibition! 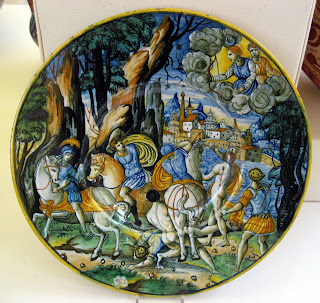 I love decorative arts. Most of my favorite museums are those in which I can get lost for hours just staring at beautiful things. 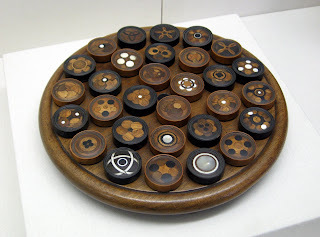 I've been partial to many of the Smithsonian's collections. Of course, I would be. For six years, we visited Washington, DC quite regularly...to drop Mathias off or pick him up at the Kirov Academy of Ballet. I thought I'd go into "museum withdrawal" without these trips. Fortunately, we've had reason to go to DC since last year and now I've found that the Birmingham Museum is quite blessed with a fine assortment of quality items. I've already posted some of the many images I took of the gorgeous stained glass windows on display. 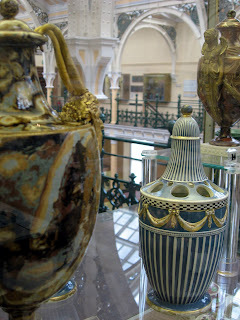 Yet, there are hundreds of pieces of porcelain (Stoke-on-Trent isn't far away...nor are many of the other factory cities). Arts and Crafts and Pre-Raphelite influences are obvious...and among my favorite styles. There are displays of jewelry and wrought iron. 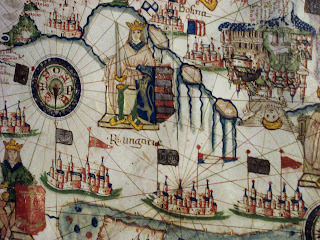 There are some textiles and one very fine antique map on vellum. I took dozens of pictures and deleted most. It is hard to get a good image through plexi-glass, especially trying to avoid reflections. I sketched too. These are some of the pictures I really liked. I especially like this museum's changing exhibits in the "Gas Hall". It is generally modern art, even local to the area. It is interesting to see how the British view, display, and market contemporary work.